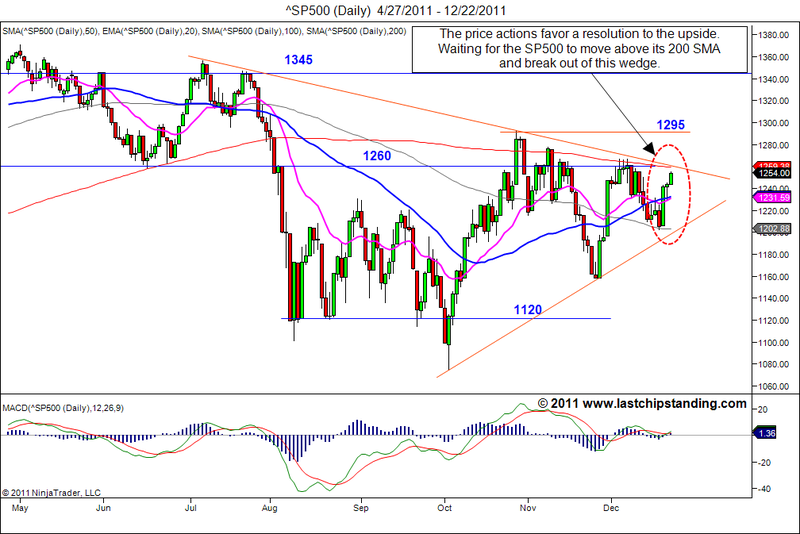 Looks like Santa Claus is bringing the bulls a present for the holiday by having the SP500 breaks out of the wedge and move back above the 1260 level. 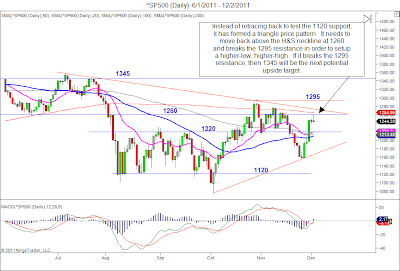 The daily chart for the SP500 shows the recent price actions seem to favor an upside breakout. 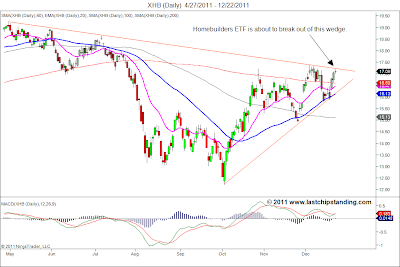 And not to overlook the homebuilders, they too are showing some sign of upside price trend. 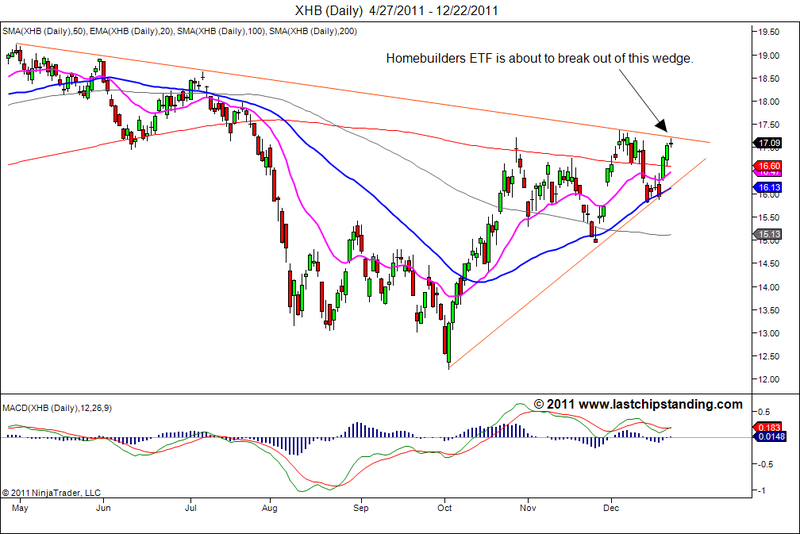 Take a look at the price chart for the homebuilders ETF, XHB. 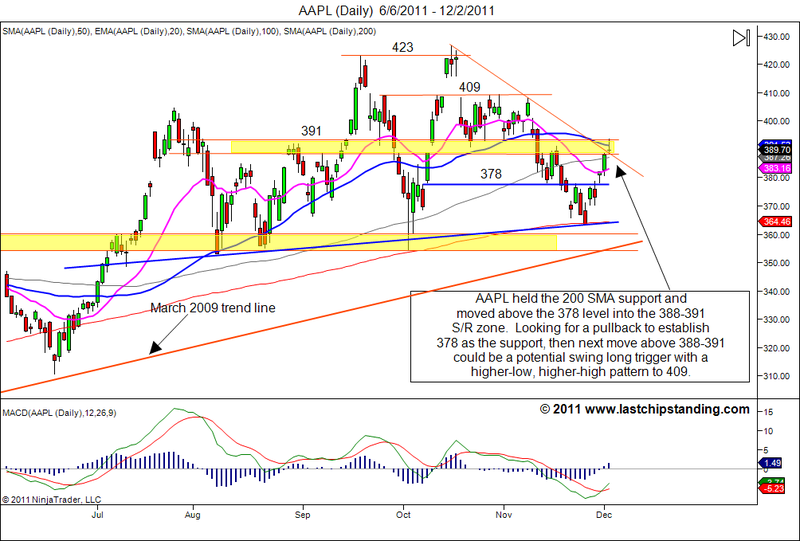 Finally, Santa did not forget AAPL. 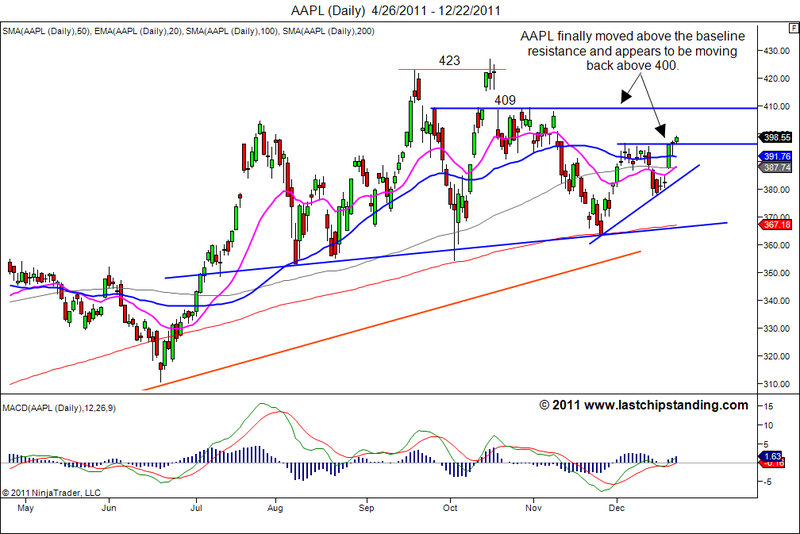 It too has moved above the baseline near 396 and appears to be making a move back above the 400 level. 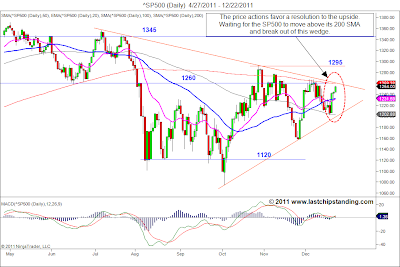 If these price actions hold up and the SP500 stays above 1260, then the SP500 could end the year 2011 in the green. 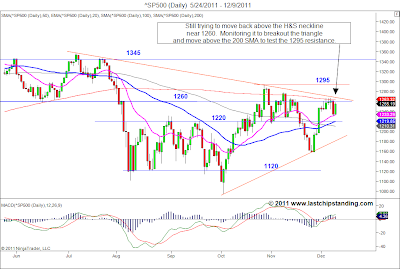 The market still have not made a decisive move in either direction. 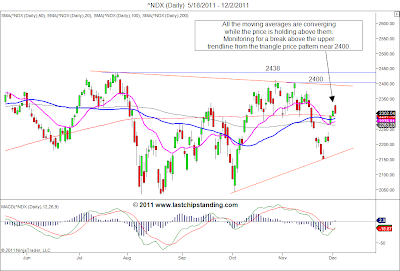 Another OpEx week is upon us, and likely we will see additional volatility while we wait for the market to choose a direction. 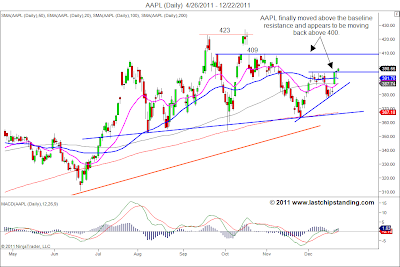 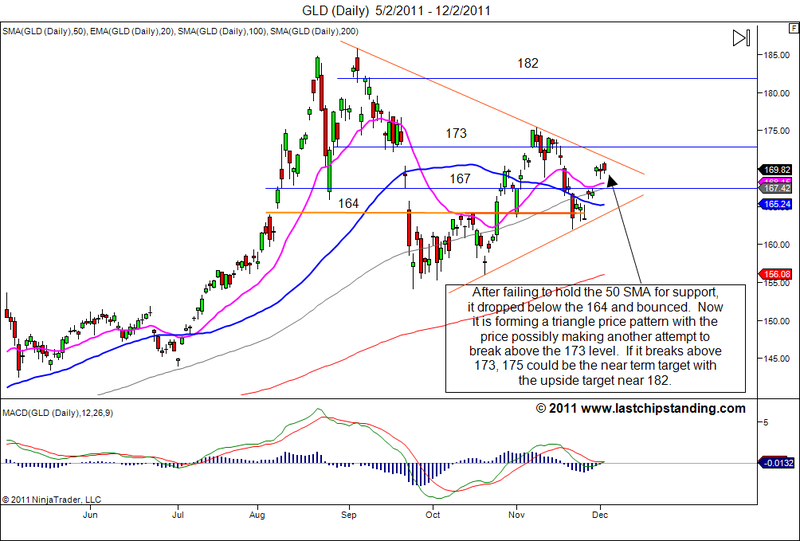 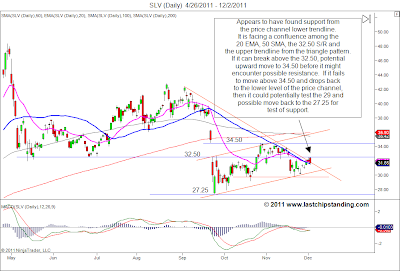 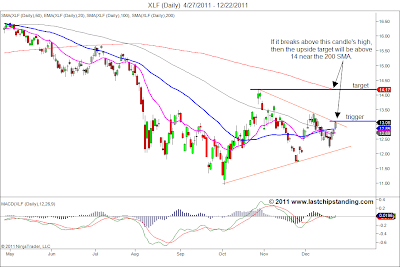 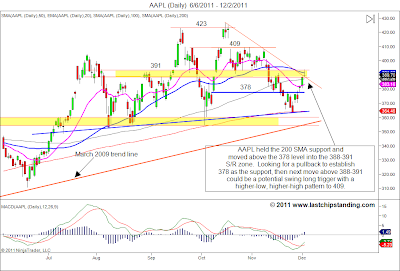 Latest updates for GLD, SLV & AAPL. 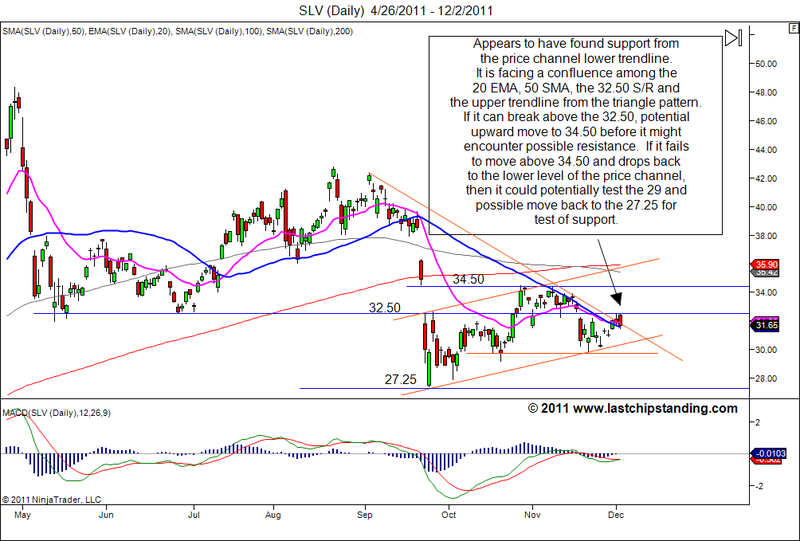 Click on the chart to get a larger view to read the commentary. 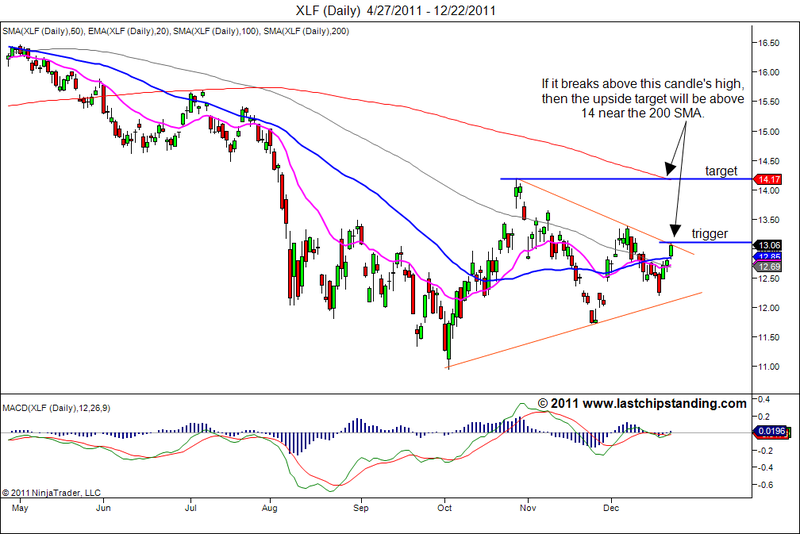 Just when one think the market is heading one way, some tricky appears and move it to the opposite direction. 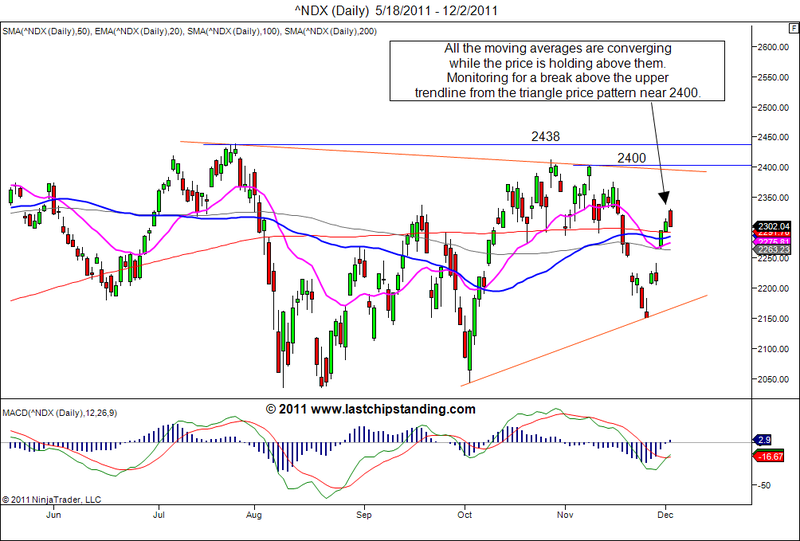 Whether it was the encouraging Black Friday shopping results or the European/Central Banks trickery, the market definitely has bought the holiday cheers to the bulls. 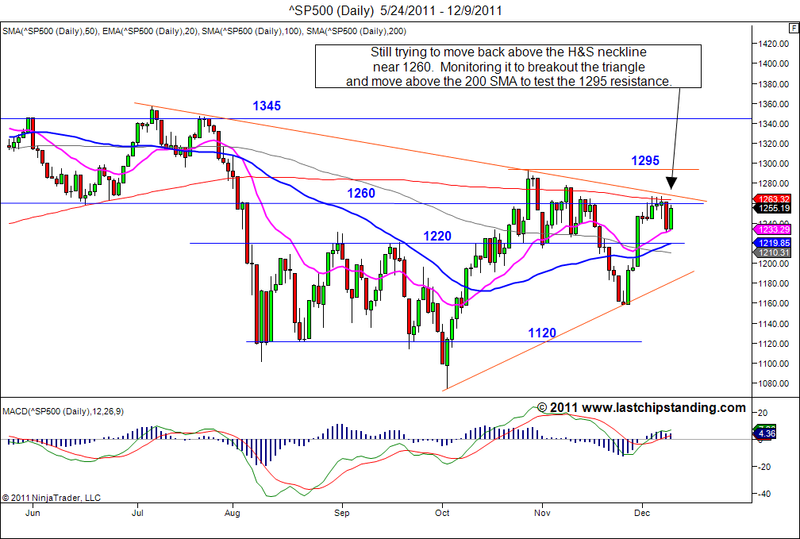 The SP500 has bounced off the 200 SMA and it is testing the 1260 (H&S neckline) once again. 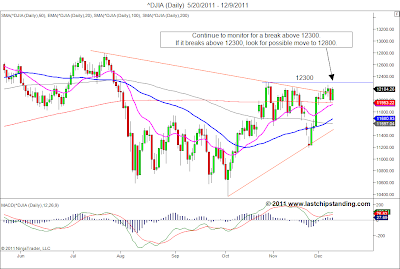 Although it printed a shooting star candle pattern on Friday, any consolidation under the 1260 at this point could simply be building up more momentum for a surge above the neckline and move into the 1300 territory. 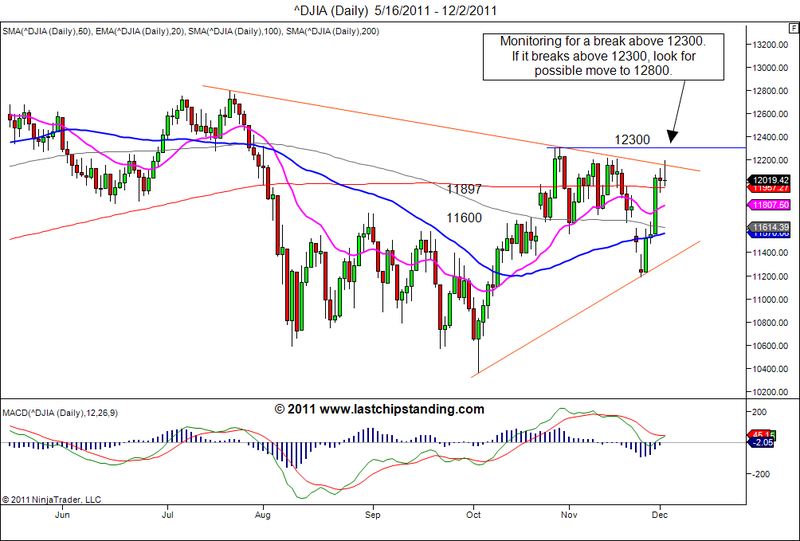 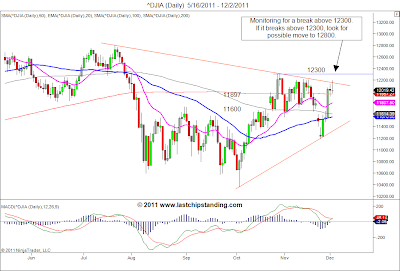 The DJIA printed a doji while sitting on the 200 SMA. 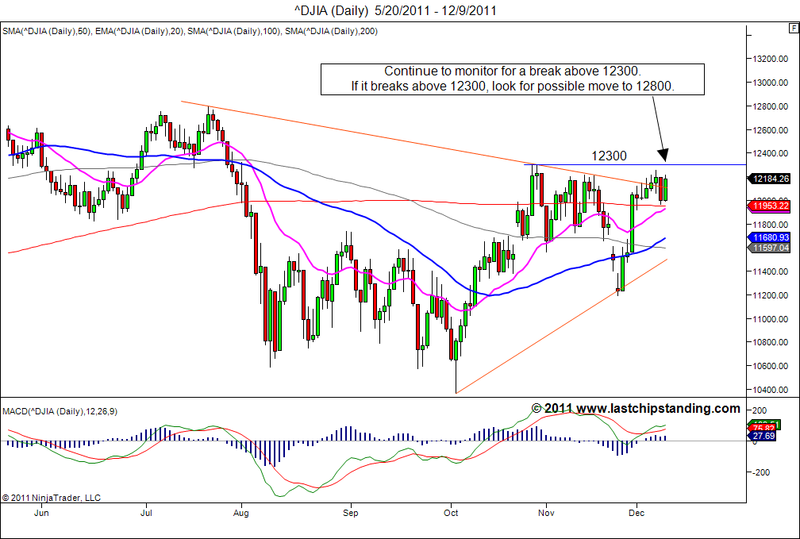 This index can be setting up for a move above the 12300 level. 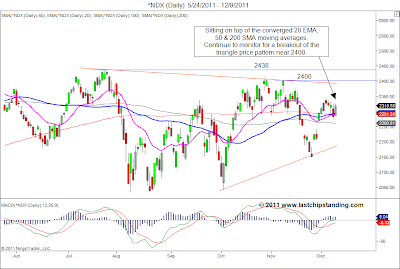 The Nasdaq 100 20 EMA, 50/100/200 SMA are all converging with the price near the convergent point. 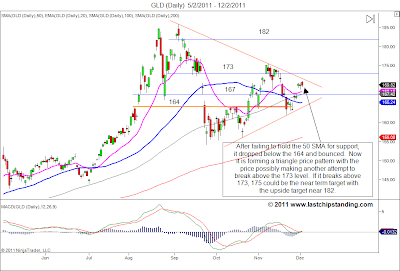 It is sitting in the middle of the triangle with a rising MACD. 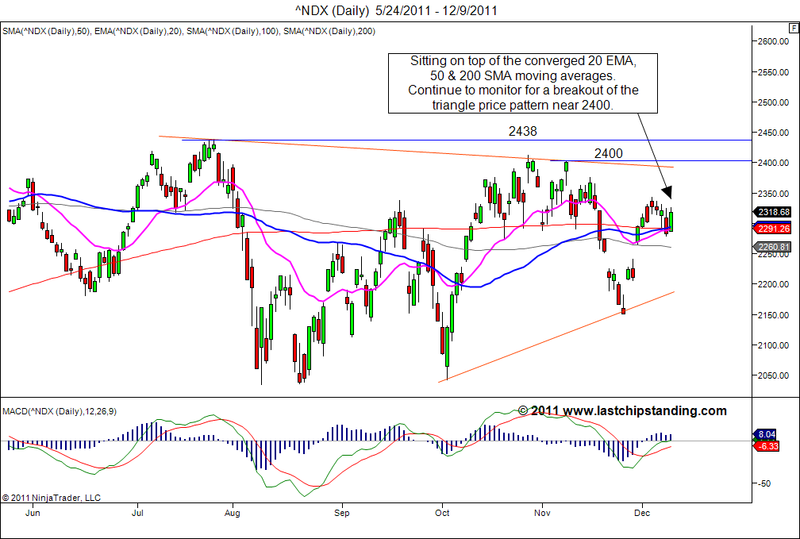 These technical signs indicate potential further upside and can leads to upward move above 2400. 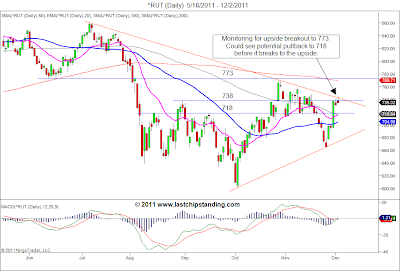 Finally, the Russell 2000 is bumping up against the 738 resistance and the upper trendline of the triangle price pattern. 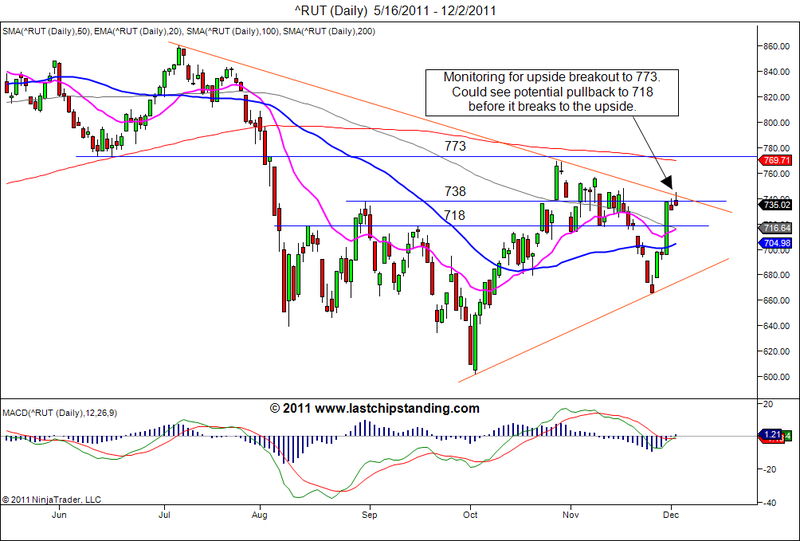 When it breakout of this price pattern, it could potentially move to test the 200 SMA near the 773 level.